Blah Blah Bklyn: D365: Day 4 - gettin' my LIP on. D365: Day 4 - gettin' my LIP on. My first trip to the gym with Dex didn't work out quite the way I'd expected - this is going to take some fancy math skills, I think. Any tips to stabilize BGs for a workout with temp basals, etc? I'd rather avoid a pre-gym snack, since exercising with food in my belly always makes me feel a bit ill. I like to use the low sugar gatorades or powerades, it gets expensive though going to the gym 4 days per week, 2 bottles per trip. I've been tempted to try a smoothie at the beverage bar but I'm too embarassed to break the carbs down in front of all the fitness fanatics at my gym! Ugh - pooh. That's not fair. Are you connected with Gary from running with type 1 or Bradford on TuD? They are both athletes so may have more intense routines, but I bet the theory they use can be applied. 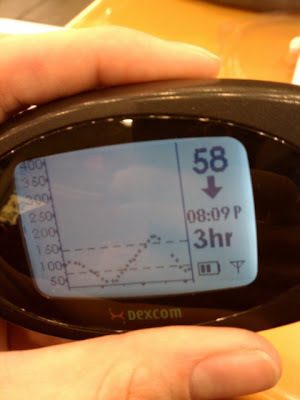 I think lowering basal 2 hours before hand is commonly used - Caleb's endo recommended that once. It's fine if you know exactly when you're going to be exerting yourself, but does not provide for the spontaneous activity. I know kids who will drink Gatorade throughout a game or practice too, like Diabetic Diet suggests. Good luck! You will figure it out! the only way is by trial and error. The diabetes fairy left me a present!! Kickoff to 2011, or my new LIPs!